Motorists are being warned of "savage" petrol price increases regardless of any government attempt to shield them from the carbon tax. Prime Minister Julia Gillard is trying to ease concerns about carbon pricing by saying households, tradespeople and small businesses using light commercial vehicles will be exempted from the tax on fuel. 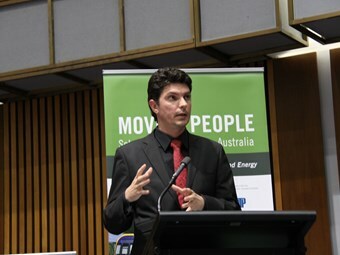 But speaking at a public transport conference in Canberra this week, Greens Senator Scott Ludlam told attendees the impact of a carbon tax on petrol prices "fades into insignificance" when considering the role of peak oil. "I would strongly, but respectfully, disagree with that statement that we don’t have to worry. I think we have to worry about a savage petrol price increase whether it makes its way into the carbon price or not," Ludlam says. He warned of prices hitting $8 per litre due to peak oil, adding that even a carbon price of $100 per tonne would only lead to increases of 20 to 25 cents per litre. "I think in the medium term and perhaps in the short term we’ve actually got bigger fish to fry." Ludlam made the comments during a speech at the Emerging Crises Summit held at Parliament House, where he also lamented the level of political debate on fuel as "kind of dismal". "We are not having a debate on the fact that one of the world’s foundation commodities has peaked and we’ve hit the halfway mark of the easy stuff. There’s no way back from that," he says. "It’s like a tidal wave rising up behind us and it’s like some kind of political taboo in this building." As well as criticising the Federal Government for failing to deliver an energy white paper or a peak oil strategy, Ludlam took aim at bureaucrats. "We’re flying blind. It’s very, very difficult to get policy makers in this place to get a grip on the sense of urgency," he says. "I think it’s wishful delusion if we imagine that we can just drill our way out of oil depletion and that gas prices won’t then follow oil through the roof, we’ll be running our aviation fleet on corn starch or that there will be an electric Tesla roadster in every driveway." Ludlam says Gillard’s decision to shield select groups from a carbon tax on fuel will deliver a significant hit to revenue. As the Prime Minister prepares to announce the carbon tax package on Sunday, Bus Industry Confederation Executive Director Michael Apps says the scheme will be "most perverse" if it leads to disincentives for people to switch to public transport. He used the summit to launch a new poll that found 87 percent of Australians support improvements to public transport, with 82 percent saying the Federal Government should increase funding. "Public transport is not good enough," Apps told the conference. "At peak times in every capital city public transport is full." The Emerging Crises Summit was organised by a coalition of public and active transport groups, including the Bus Industry Confederation, the Australasian Railway Association, the Heart Foundation and Cycling Promotion Fund.